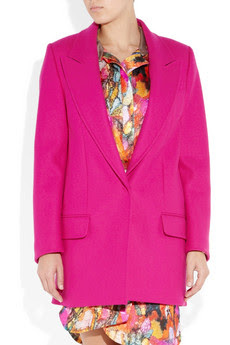 Ever since I posted about the bright pink blazer outfit I found vis pinterest last week, I haven't been able to get buying one out of my mind. So, it's lucky that it looks to be a big trend this season. To get an idea of how to wear the look, I've trawled around to find my favourite looks. Pink does seem to be a popular look, and high street names like Whistles and H&M are going all out to get them on us as quickly as possible. Dolce and Gabbana jacket, reduced from £975 to £292.50 - if you can afford it then this is brilliant, and perfect for temperamental spring weather. From netaporter.com here. PS - on the subject of colour, check out this AMAZING tumblr account called colormeconfused. These pink blazers look amazing! 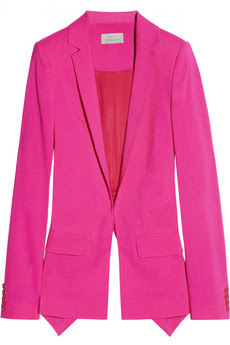 THis made me REALLY want a pink blazer! might not be able to pull it of as well as these lovely ladies though! I bought one last year from Zara and am obsessed. Get sooo many compliments on it. You MUST get one!! LOVE this trend. Pink blazer + black Chanel 2.55 = hubba hubba. 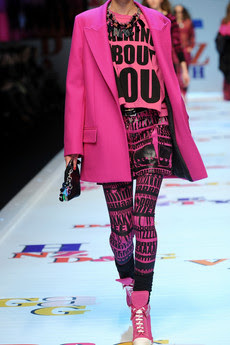 Bring on the sunshine, baby..
Wow, Pink blazers!!! Love pink blazers, i've been dying to get my hands on one, haven't had any luck tho!! !